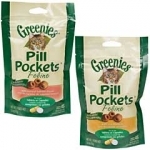 Patented Pill Pockets take the hassle out of medicating your cat, while providing your them with a healthy treat. Made from all human-grade meats, Pill Pockets completely conceal medicinal odors and taste so good that your cat won't know there's medicine inside. Contains probiotics for intestinal health and vitamins C & E to promote a healthy immune system. Material is easy to pinch closed and fits both capsules and tablets. 100% Pure USDA Inspected Freeze Dried Beef Liver Cat Treats. Less than 3 calories per treat. Cats love the taste of PureBites because our treats are freeze dried to lock in the aroma, texture and freshness they crave. 100% Pure USDA Inspected Freeze Dried Chicken Breast Cat Treats. Less than 1 calorie per treat. Cats love the taste of PureBites because our treats are freeze dried to lock in the aroma, texture and freshness they crave. 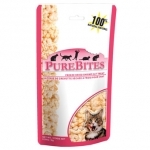 100% Pure freeze dried shrimp cat treats. Less than 1 calorie per treat. Cats love the taste of PureBites because our treats are freeze dried to lock in the aroma, texture and freshness they crave.